I’ve always wanted to do one of those large close up cat portraits that so many artists have done but I never had the right reference. I wanted to work from my own experiences and I finally got the perfect shot. This is Assiqua, a female Sumatran Tiger in our local (Adelaide) zoo and I caught her licking her lips as she looked at me. Note how the whiskers on her right are all pushed up by her tongue. 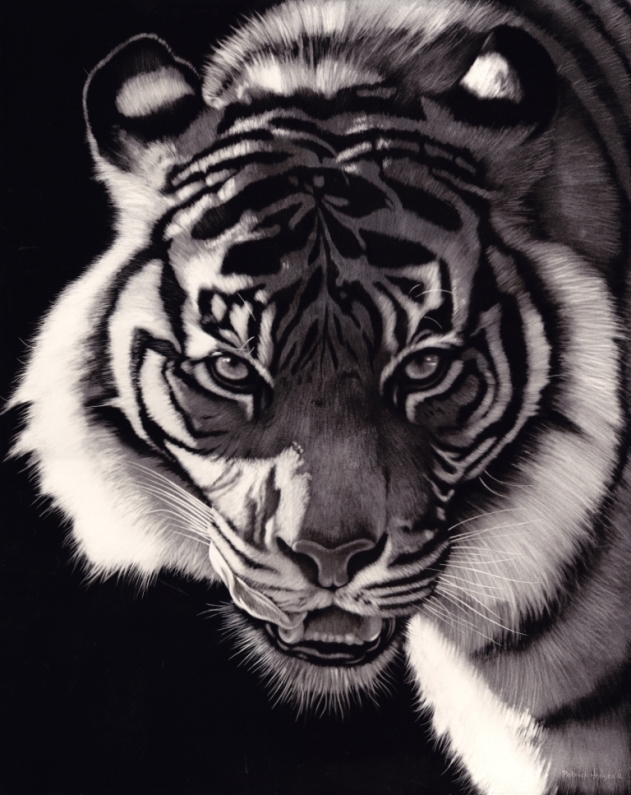 This is a 20″ x 16″ scratchboard and is created by using 80% fibreglass brush, 15% steel wool to get the backlit areas and 5% blade to get the whiskers and hairs at the edge. In reality there were no highlights in the eyes but I used artistic license to add more life. She is a magnificent animal and I really hoped to convey a sense of drama with her as if to say “You come one step closer and you’re mine”! Great cat! All types of felines make great pictures. One of these days I hope to be able to do one as good as yours. Beautiful work. The lighting is fantastic. I am courious about your fiberglass tool. I use mine sparingly due to it seems to work well for a few strokes and then not as well with use. I am used to washing the build up off and then let dry. I am using the Essdee brand.